Barstool Sports president David Portnoy and loyal Patriots fan crashed the Superbowl opening night party but it didn’t last long. Portnoy snuck in with an epic disguise wearing a fake mustache and an I love Goodell hat. Portnoy is not exactly on the commissioners Christmas card list after handing out thousands of Roger Goodell clown banners last season at Gillette. 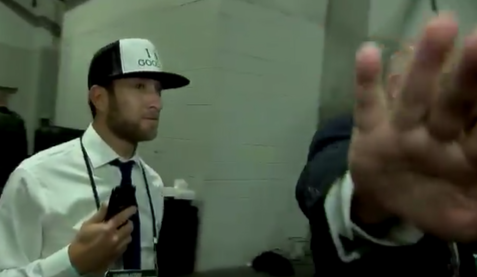 Portnoy was able to get a few interviews in and was clearly trying to get into the heads of the Rams quarterback Jared Goff and Defensive Lineman Ndamukong Suh . Portnoy’s stay wasn’t long though. He was eventually discovered and received a ban from the Atlanta Hawks State Farm Arena where the event took place for one year and charged with criminal trespassing right before the Patriots came out. Portnoy would go on to explain his night in a profanity laced tirade below.